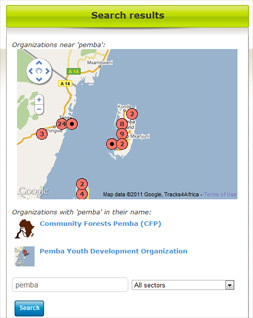 Envaya makes it easy to find other civil society organizations that are relevant to your organization. By visiting the websites of other organizations on Envaya, can see their latest news, communicate, and engage in discussions together. If an organization hundreds of kilometers away has a successful project and writes about it on Envaya, you can get ideas for your own organization. To browse all of the organizations on Envaya by name or location, click Explore at the top of the page. 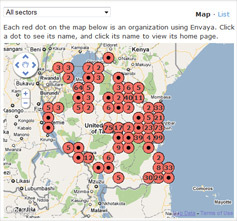 This page shows a map of all organizations using Envaya. 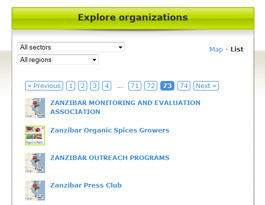 To change which type of organizations are displayed, click All sectors, and choose a type of organization from the menu. To zoom in on a particular location, double-click. Click any red dot to see the organizations at that location on the map, then click the name of an organization to view its home page. 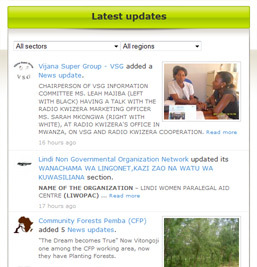 The Latest Updates page shows the most recent changes that organizations have posted to their websites. Click any item to go to that organization's website and read more.